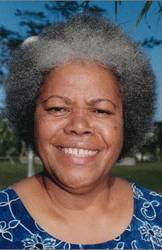 Grace Mera Molisa is considered one of the major authors in Vanuatu. She has played an important political role in the women's movement for emancipation and independence. She is also considered one of the most revered intellectuals of her time. She was born in 1946 in Ambae island, Vanuatu. She has since died in January 2002 in Port Vila. In 1977 she was the first ni-Vanuatu to obtain a Bachelor of Arts at the University of the South Pacific. She has written a number of poems regarding women's issues and other social and political issues to which she is well known for.